Battery materials startup 24M revealed Wednesday that it has developed a “dual electrolyte” architecture that could unlock significant gains in battery performance for electric vehicles. Prior to the announcement, the MIT spinoff constructed a separator that allows ions through but prevents the electrolytes from mixing. “We’ve made enough progress that we think we can tell the world,” President Rick Feldt said in an interview. The company has built dozens of units and tracked performance improvement over recent months. That said, commercialization could be a couple years off. “We have a lot of work to do,” Feldt added. EV batteries require higher energy density to power longer driving ranges. Today’s batteries provide between 180 and 240 watt-hours per kilogram, depending on chemistry, according to battery data from Wood Mackenzie. The dual electrolyte can already deliver 350 watt-hours per kilogram, 24M executives said. They believe that it can be refined to the point of 450 or 500 watt-hours per kilogram, but the challenge is making sure it maintains that performance over enough cycles to be useful. 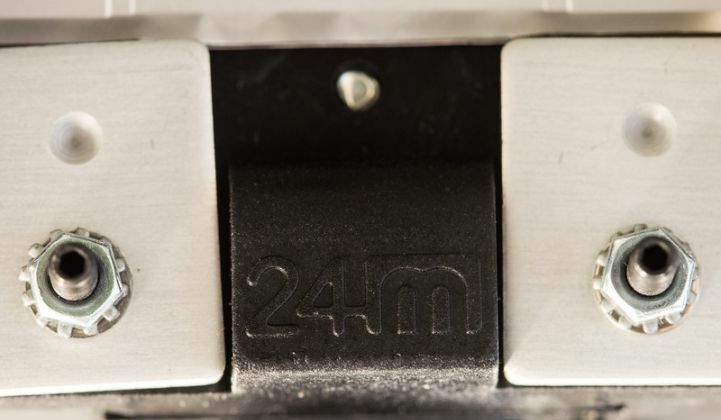 24M has signed up an undisclosed international company to help co-develop and manufacture the specialized separator. If that effort proves successful, it could be useful in other applications that call for energy density, like personal electronics and aerospace. The technology won’t be limited to lithium metal, either. That chemistry promises the highest energy density, but designers could use dual electrolytes to customize batteries for other attributes, like charging speed. Many paths could lead to lithium metal batteries. One major approach is to keep tweaking conventional battery designs to eke out more cycle life. The 24M team dismissed that method as unlikely to yield a major breakthrough. A trendier avenue is solid-state batteries, which eliminate the liquids that pose a fire risk in conventional cells. That could make lithium metal more achievable. Researchers have spent years tackling solid-state technology, and several companies have raised considerable sums to throw at the problem. The mysterious QuantumScape pulled in $100 million from VW last summer, and Solid Power raised $20 million last fall, to name a few. Toyota and Panasonic teamed up in January to develop solid-state batteries for cars. However, solid-state still needs to deal with physical challenges, like connectivity issues between solid materials. If it gets commercialized, solid-state will require a whole new set of factory lines to produce. That could take years. That’s where 24M sees another advantage: Its dual electrolyte design uses the same manufacturing technique the company has spent the last eight years developing. The company’s production line extrudes electrodes as a dense, dark putty, which gets squeezed into battery packets. This eliminates many steps required in conventional cell production, and lowers the upfront capital cost to set up a factory. The company has a small semi-solid electrode production line in its Cambridge headquarters, and plans to erect a 100-megawatt-hour line with an industrial partner later this year. By the time dual electrolytes become ready for mass-production — by no means a guaranteed outcome — 24M’s technology could have a global manufacturing presence that could quickly adapt to the new product.